A presenter from a local radio station is raising his voice above wafts of barbecuing breakfast sausages at the starting line of the fourth annual Ribble Valley Pub Walk. A presenter from a local radio station is raising his voice above wafts of barbecuing breakfast sausages at the starting line of the fourth annual Ribble Valley Pub Walk. Holding his microphone in front of a portable studio, he’s using every last bit of his breakfast show energy to cajole 300 people and their bandana-wearing dogs to stand up and stretch before the day’s exertions begin. Even at 11 in the morning, the sun is beating down as the crowd moves in unison amongst the ancient ruins of Whalley Abbey. Every person here, waggling their fingers and twisting at the waist, is about to start a 12 miles long sponsored pub walk, visiting 10 pubs along the way. The radio presenter declares that he’s happy with our progress and it’s time to move to the starting line. The nervous laughter stops. It’s fair to say there’s a little apprehension in the air. After a few motivating words of thanks from the organisers, Stella, the Deputy Mayor, snips a ceremonial ribbon under the great arch of Whalley Abbey gatehouse, and lets the eager gang of fundraisers loose into the streets. Despite being a fairly new tradition, the Ribble Valley Beer Walk has been adopted quickly and totally by locals. It is, after all, a great excuse to reconnect with the nearby countryside and perhaps more importantly, some of the area’s famous country pubs. And then there’s the charity aspect of it all, too. That buzz is no doubt helped by the sheer number of public houses each walker has to visit along the way. This year, the route was extended to include even more pubs, and to reach further into the mysterious lands where the Ribble Valley ends and the protected Forest of Bowland begins. It might only be 12 miles, but it covers a lot of ancient ground, strewn with old county boundaries named after long-dead Lords and Norse kings. Tolkein used to walk here, you know. So, we began the trail in the picturesque and posh village of Whalley, which usually expects drinkers in shinier shoes and tweedier jackets than our muddy-booted, matching t-shirted rabble. Rammed with walkers ordering their first drinks of the day - mostly wise halfs of cider - our first stop off at The De Lacy Arms gave us a chance to sit down in a hidden corner and worry about how we were going to last the day. As we sipped gingerly, a group of impressively energetic ladies with pints of Stella told me they were starting as they meant to go on, asked me to take a photo of them together, downed their drinks and left. I didn’t see them for the rest of the day, but their backpacks and walking socks told me they were in for the long haul. The Whalley segment of the walk is notoriously brutal. Within the past 12 months, the opening of a new bar selling independent and Belgian beers in the village means there are now five pubs to hit within less than quarter of a square mile right at the start of the walk. Six, if you class an unofficial stop-off back at Jack’s Bar for a can of something hoppy to take with you. Then, and only then, are you ready for the walk across fields and down country lanes to the Eagle at Barrow. After quickly finishing pints in three more pubs, feeling the buzz, emotional after seeing footballers cry over their national anthem on the TV in The Swan, we left for the fourth. Stepping out into the heatwave, eyes adjusting to the blinding sunlight bouncing off bright limestone, we clocked a large group of walkers standing at the village bus stop. Cheaters. We shook our heads dramatically and stepped into the next pub, wishing we’d had the foresight to realise we could have got away with it too. For them, the aim wasn’t to make it to every pub, but to the finish line. I asked them whether this would make them feel like they missed out. “We’re from Fence [a village on the other side of Pendle Hill],” added a friend, by way of explanation. I nodded. He may as well have said he lived on the Moon. Then Melissa accidentally poured her drink all over my trousers, so I high fived her. Pint four, completed. Time to get on our merry way. Over meadows and through stiles, waves of strangers in matching shirts slowed down to take photos of the valley and stragglers sped up, looking at the time, wondering if they’d make the final 6 miles down to the Three Fishes from The Red Pump Inn. I asked a walker who was about to set off ahead what he’d been drinking. 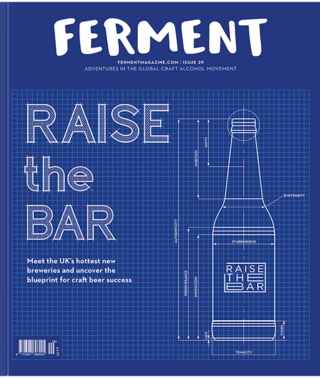 In the North West, we talk about the flourishing of the new-wave beer industry being somewhat slower than in the rest of the country. We often wonder if it’s down to a lack of interest from customers - but beer is loved here. Maybe it’s about accessibility. People enjoy change, but they need to be gently persuaded into it, and perhaps the number of non-freehold pubs in the area contributes to customers not being challenged. 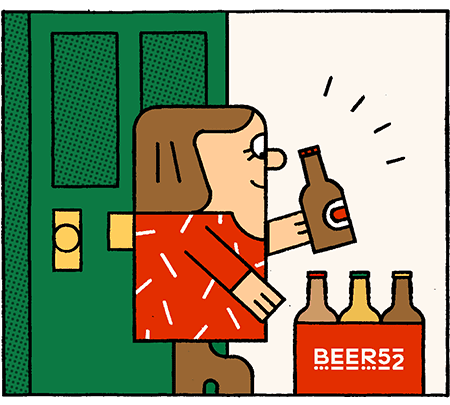 We praise our local breweries, but many left their parochial priorities a long time ago, buying up their own pubs and reducing drinkers’ experiences of what they know as “craft beer” to their own manifestations of it. In retaliation, there are vacant buildings all over the valley being bought by entrepreneurial former pub managers who want to sell beers they choose - not beers chosen for them. It’s exciting to see happening in front of our eyes, not least because it continues to ask more of the current larger breweries in the area, and encourages new, smaller breweries to germinate. Things are happening. Just slowly. Funnily enough, these thoughts came to me as I sat down on the grand lawns of the Aspinall Arms with a pint of Bass, looking out over the glittering River Ribble. Why Bass? Because it was there, and it seemed rude not to. Like refusing to shake a person’s hand. Jackdaws cawed in the green meadows on the other side of the river, where lambs had lolled in the heat just weeks before. Oak leaves fluttered high above our picnic benches. Pendle Hill loomed over us all, green and handsome, and stone cold sober. We’d walked nine of our 12 miles and visited all but one of the pubs. I was getting emotional. Time to set off again. We took a limestone gravelled track back into Whalley, following a route where 150 years earlier, we’d have met horses and carts piled high with hay. While we walked, we talked loosely with strangers about the world and our lives, totally united in inebriation. When we reached our final pub, The Dog, to collect our certificates, we saw people from the starting line chatting with pints, as though today had just been another day. I got another round in. When Jaipur’s on keg in the Ribble Valley, you don’t pass up that chance. With the addition of beer, what was set to be a long trek through familiar countryside turned into an afternoon of rediscovery. Every pint was bringing me closer to remembering what I loved about our scuffed and well-loved country pubs in the first place. Yes, it would have been dreamy to have been able to walk into any pub along the way and ordered a Highwire Grapefruit, a Keller Pils, or an Arise, but we’re not there yet. So we drank the local ales we’ve grown used to and added lime to whatever lager we fancied and in the sun, those pints worked just fine. Sometimes it’s not what you’re drinking. It’s where you’re drinking it, and who you’re drinking it with that makes all the difference.